This is an edited rehash of a stream of tweets I made around 2013 or so, revisited today on the occasion of so much interest in Fred McFeely Rogers, one of the greatest Americans I know of. I'm watching him right now, streaming on Twitch TV. I was an early mocker of Rogers, based on a slight amount of attention I paid his show around 9th or 10th grade. Later, my friends Randy and Torger communicated their admiration for him to me, and for the last year I lived in Colorado I made it a habit to watch the show with them every day after I got off work. I made up many of the track titles, which appear to have been sufficiently descriptive or obvious that they were used by Way Out Junk and by the helper (in the Rogers sense of the word) who kindly put them all up at YouTube. As you can see, we now know the real titles, and some of my guesses don't comport with reality. If it happens that you need to search for the tracks some day, consider using both sets. This is the page of results I get searching for the album name and the first track and youtube. Forgive me for not embedding each and every track here, but things change on the net, and by putting all the eggs in this basket, I might find it easier to change this post if it should pass that it gets pulled from there. Before the tracks begin, let's look at a short video from 1969, in which Rogers testified before a Senate subcommittee which was hastening to do Nixon's bidding in de-funding public television's $20M budget. Speaking to Senator John Pastore (D-RI), Rogers communicates quietly and earnestly, and in a few short minutes, he saves NET (or whatever the network was being called at that moment in time) from the axe, and probably gives an angel its wings. It gets me every time. Now for my guided tour through the tracks on this album of wonders. I can't count how many times I've listened to the whole thing. When I listened to tapes, this tape was always in the ones I carried to and from work and such. It was one of the first things I ripped to mp3, and has had a place on every music player. It's on my phone now. I am in the tank for it, and in my opinion it is a work of genius—genius in the service of a good heart. (Did you watch the Senate video?) In editing the tracks, I tried to start each one with the song portion. There may be instances where I just couldn't separate a song from its intro, but that was the plan, anyway. “It’s Morning” has a familiar tune to those of us who’ve watched his Neighborhood. Fred Waring & His Pennsylvanians back it. All the songs were written by Rogers, an underrated composer. His outstanding musical collaborator, Johnny Costa, played the music on the show with his trio live every time, including opening and closing themes. His album of songs from the show is well worth seeking out. Costa based the very familiar lead-in to the opening theme on a passage from a Beethoven sonata, according to an interview that is also on YouTube. This album comes from before the Costa years. "It's Morning," sung by Josie, sets up a mood of joyous anticipation that is so very Rogers. 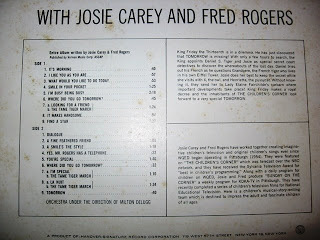 Rogers, incidentally, is not heard as himself on this LP, but every voice that isn't Josie being Josie is the sound of Rogers, and he wrote every word and note, so he's not exactly unheard. “I Like You” shows Rogers’s acceptance of his listeners and viewers. He really does like us just as we are. “What Would You Like” and “There’s a Smile” are upbeat booster songs. What would you like to do today? We are offered a number of possible options, all cheerful. There's a smile in your pocket, and it would like to be on your face. Ah, but we’re approaching the castle of King Friday XIII! He's a very busy man; a very busy man! “I’m Looking for a Friend” is so vivacious it makes us almost fear Josie’s quest for friendship, so similar to our own search. "It Makes Handsome” is a charming calm-down from Grand-Pere, in English with French syntax. Daniel stays with him as Josie goes on. “Find a Star” slows Josie (and the story) down some, but she's still finding some nice clear notes to bring out. Make a wish! Josie cues her own song, “Smile,” anticipating a lesser song in “Annie.” Say, these songs would make a swell Broadway show. Just take the whole album to the stage. I'd watch it. 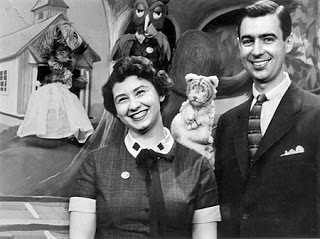 “Meow, Mister Rogers” is an explanation by Henrietta. Oh, yes, Mr. Rogers has a telephone! A very short epic, worthy of multiple listenings. X honors Josie in “You’re Special”: “You’re an ice cream cone / You’re a lollipop…” As a bonus, X recites his poem about Y: “Y, by X.” We will hear this tune again. "Where Did You Go?” is a different song which reprises Josie's growing frustration at the lack of clear progress so far. But who's this, hanging by her toes from the ceiling? I'm a broken tooth, darling! The microtonal singing is worthy of Darlene Edwards. It may be one of the most awesome puppet solos recorded, and I've heard a few. Daniel leaves Grand-Pere in a sweet, bilingual “Nocturne Duet” that reminds us that Mister Rogers, like Sparky, was a man of faith. Fait accompli, Josie & Daniel are back “At Friday’s Palace” with respectful four-toothed smiles to receive an exciting reward. And there we are. 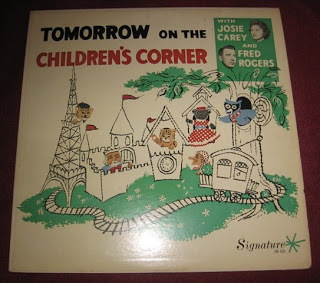 Adventure over, we look forward, not back: “Finale: Tomorrow!” anticipates more delights to come, and comes closer to the familiar version of the song that ended each day's visit to "Mr. Rogers' Neighborhood." I'm hearing him sing it right now as he puts on his outside shoes and exits another show at Twitch. And here comes Costa's daily improvisation to put a ribbon on it. I love this record. 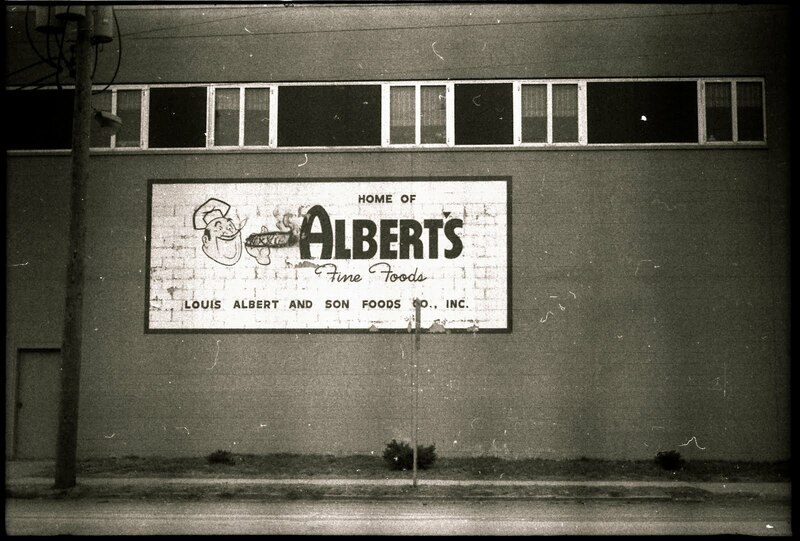 Once again thanks to Kathy B. Before I go, though, this should also be included in any discussion of Mr. Rogers should also include one of the most striking examples of quiet heroism I have ever seen. On May 1, 1969, Rogers went in front of a Senate committee that was intent on defunding public broadcasting, as it then existed. He spoke to them quietly and earnestly, and with nothing but conviction and persuasion, he won those tough guys over.